Kakao Bank solidified its position as South Korea’s leading direct bank in its first month of operation, data showed Thursday, although concerns persist over customer service scams and loopholes in authentication. 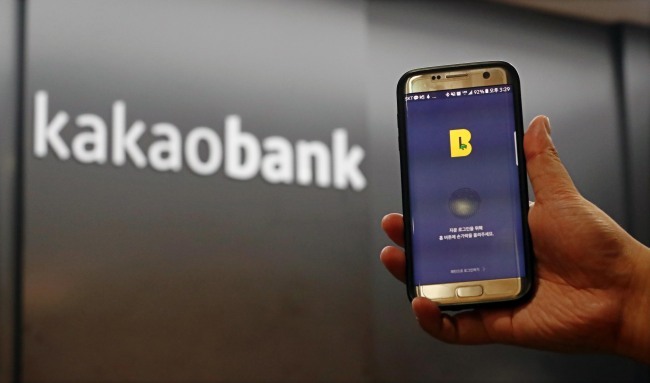 As of Wednesday, Kakao Bank, the second online-only bank to open in Korea following K bank, attracted some 2.9 million bank accounts, through which customers made deposits and savings worth a combined 1.8 trillion won ($1.6 billion) and took out loans worth 1.3 trillion won. These figures were at least five times higher compared to K bank’s in the first month of April, when K bank users deposited and saved 320 billion won and borrowed 220 billion won. Among the Kakao Bank account holders, 70.1 percent owned debit cards, the only tools to physically withdraw cash from accounts and make payments. On April 5, about four months before Kakao Bank’s launch on July 27, the bank’s Chief Executive Lee Yong-woo expected the combined volume of deposits, savings and loans to reach 500 billion won by the end of 2017. Kakao Bank has offered favorable interest rates to depositors and borrowers as well as minimized outbound offshore remittance fees -- to about one-tenth of other banks’ average. Borrowers seeking low interest rate loans flocked to Kakao Bank, which resulted in the decision by its board of directors on Aug. 11 to issue additional stocks to raise capital worth 500 billion won in total, two weeks after the launch of the bank with paid-in capitalization of 300 billion won. The bank’s popularity, on the other hand, has also revealed that its users are exposed to security threats. Kakao Bank on Tuesday warned users to beware of identity theft. As many users suffer from a lag in customer service, scammers disguised as customer service center staff have approached Kakao Bank users and asked for personal information over the phone. A combined 10 cases -- eight from Kakao Bank and two from the state-led watchdog Financial Supervisory Service -- were reported as the scams, but no damage has been reported. In Tuesday’s announcement, the bank stressed it would not reach out to customers in advance for service. Earlier, another 10 cases of an unidentified amount of deposits made or loans extended without the consent of users were reported to Kakao Bank as of Sunday. The account holders’ spouses or children, who had shared private information with the holders, committed such illegal use of service, according to the virtual banking institution.